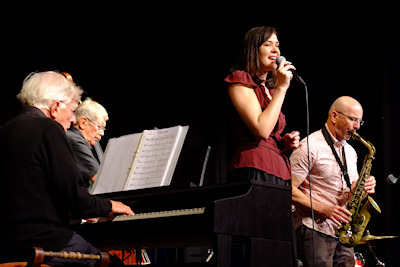 A chance encounter whilst on holiday in Australia when Newport Jazz Club promoter Bill Wills met Australian vocalist Nicola Milan led to an addition to the club programme when Nicola arranged to visit the UK and took up Bill's invitation to sing to an Isle of Wight audience. Opening with the Rogers and Hart number "Blue Moon" Nicola took the audience through a varied 15 number set of standards, several originals and a nod to modern performers with an excellent rendition of Melody Gardot's "Your Heart is as Black as Night". The downside is that as a visitor to the UK it is unlikely that we will get to see her again soon but she made such a positive impact with the audience that the hope is that she continues to keep in touch with Bill and makes a return visit at a future date. Sharing front line duties was jazz club favourite Tony Woods on saxophone. Back line support was provided by the Phoenix Modern Jazz Trio. The next concert will be on Sunday 17th September 2017 when the club has plays host to saxophone supremo Alan Barnes who will be paying homage to the music of Art Pepper. Alan will be supported by David Newton (piano). Andy Cleyndert (bass) & Bobby Worth (drums).Tickets are available from Vicky Cullis on 730601 or Bill Wills on 523879.